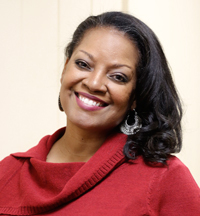 Dr. Brendesha Tynes is an associate professor of Education and Psychology at the USC Rossier School of Education. Her research focuses on youth experiences with digital media, and how they are associated with academic and socio-emotional outcomes. She is also interested in equity in digital literacy, which includes empowering uses of digital tools for underrepresented youth. She is currently principal investigator on three primary projects: The Teen Life Online and in Schools Project (TLOS), the E-Cope Project, and the Digital Equity Project. The TLOS Project is an NIH-funded, mixed-method, longitudinal study of online racial discrimination—also called race-related cyberbullying—and the assets and resources youth possess that buffer its effects on mental health, problem behavior and academic outcomes. More specifically, the study uses a risk and resilience framework to explain the differential outcomes among adolescents exposed to similar risks online. Although the internet may threaten social identity and adjustment, particularly for adolescents of color, individual (e.g. coping) and contextual (e.g. parental support) factors mitigate such risks. The E-Cope Project includes the design of a theory-driven mobile intervention (i.e. an app) to enhance adolescents’ ability to cope with online racial discrimination. In addition, a randomized controlled trial is used to determine whether the intervention is effective at enhancing youth ability to critique negative messages and use adaptive coping strategies. The Digital Equity Project is a mixed-method, multiple case study of the use of mobile devices in K-12 urban schools and the individual, environmental and technological factors that enhance academic and socio-emotional learning. One of the primary goals of this project is to better understand the unique challenges and best practices (including pedagogical strategies) of teachers in schools that serve primarily African American and Latino youth. Tynes has published widely, including in the Journal of Applied Developmental Psychology, Cyberpsychology & Behavior, the Journal of Adolescent Health and Developmental Psychology. She has also been cited in numerous media outlets, including the New York Times, the Los Angeles Times, Newsweek and Woman’s Day. She is the co-editor of the Handbook of African American Psychology and associate editor of the American Educational Research Journal. Tynes also teaches courses on lifespan development, African American child development and new media literacy. Tynes is a former high school history and global studies teacher. Before her current position at USC Rossier, Tynes held assistant and associate professor positions in African American Studies, Educational Psychology and Psychology at the University of Illinois at Urbana-Champaign. She has also been a research fellow in the Department of Society, Human Development and Health at Harvard University. She earned a B.A. in History from Columbia University, an M.A. in Learning Sciences from Northwestern University and a Ph.D. in Human Development and Psychology from UCLA.